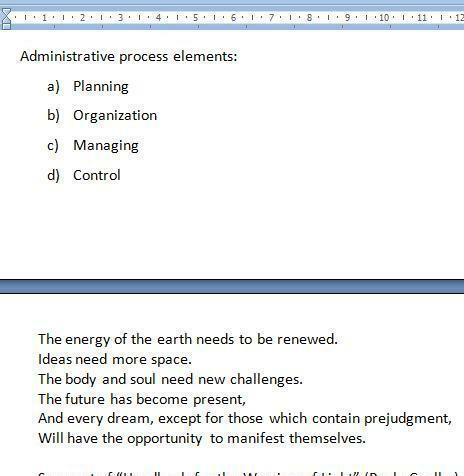 Word has a Page Break function we can use whenever we want to change to another page once we have finished writing the information we want on the current page. In other words, if we have a text with 6 paragraphs, but we want to show only 4 paragraphs on that page and the rest on the second page, we can insert a page break between paragraphs 4 and 5. 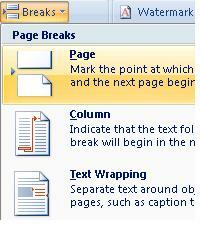 We can insert a page break to divide both paragraphs in different pages. To do this, we place the cursor at the beginning of the second paragraph (or at the end of the first paragraph), and we click on the Break icon. This will open a window with the established options and we select the one we want. In this case, we will select Page, to mark the point at which this page ends and the next page begins. 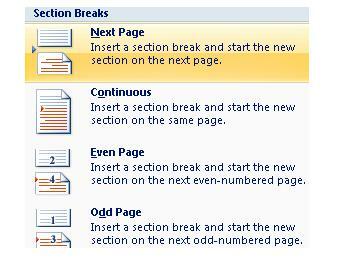 In the same manner, we can include Section Breaks. These are generally used to divide different chapters of the same document into sections. This makes editing easier. Once again, it will open up an options menu. 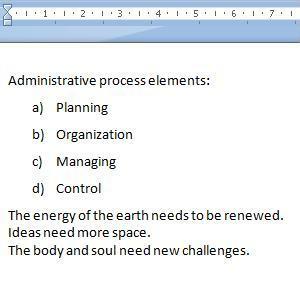 On the Section Breaks area, we select the option that fits our needs. This will depend entirely on your work.